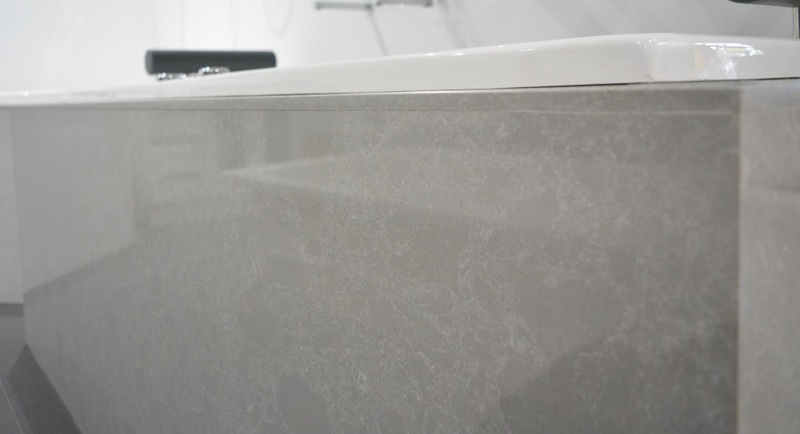 Take a look below at Melbourne’s largest engineered bathroom marble display. Thinking Bathroom Renovation? Think Engineered Marble. Here’s Why. Visit Melbourne’s largest engineered marble bathroom display, located at 80 Hume Highway, Somerton. There’s never been a easier way to visualise your brand new bathroom, than visiting a fully functioning display, showcasing two of our most popular bathroom colours, Bering and White Faraya. Why Engineered Marble Works So Well in Bathrooms.. When you think marble, cost-effective is not usually the first thought that comes to mind. Well, now with engineered marble, it can. This is because engineered marble contains up to 95% natural marble, but uses binders, resins, and other environmentally responsible additives to dramatically reduce the overall cost of the material, while still maintaining all the great features of natural marble you would expect, and then some. Thank to its incredibly low resin and calorie count and an almost completely non-porous surface, engineered marble is built to withstand even the hottest and humid areas, like bathrooms, saunas and spa areas. Engineered marble is also the only marble based product on the planet that can be used in direct sunlight for outdoor based projects, or even for building facades and external building cladding (select styles). Unlike tiles, which create the need for additional cleaning to avoid mould or mildew build up, plus the additional expense of having to hire tilers, engineered marble can be installed as floor to ceiling slabs, requiring no grout and minimal seams. This creates an almost maintenance free environment, with no mould or mildew build up on your grout. Rather than having to hire multiple tradespeople to install your stone panels, your stonemason can complete the entire process for you. From fabrication to installation, your stonemason can handle the entire load, dramatically reducing your installation costs and ensuring your 10 year-limited warranty remains solidly in place. Why not try something different and lay claim to having a product that can’t be found anywhere else in Australia, unique to your bathroom?